The Hiding Place by C.J. Tudor is her second novel. Joe is going back to where he was born, but does he really want to? No...not after what happened. Can he face his past, or will it consume him? Tudor does it again! With her writing, solid characters, and her infusion of horror mixed with mystery, this story will keep you on the edge of your seat while quickly turning the pages. This is an excellent tale of fear, confusion, and self loathing. I highly recommend this story to anyone looking for an intense read. Stephen King does it again! Though a quick read, King finds a way to get you into the story and he doesn't let go. You find yourself rooting for the characters and sometimes you find yourself crying for them. I just loved this story. Short but sweet, it is. Mariel of Redwall by Brian Jacques is the fourth book in the Redwall series. All I can say is this series is so much fun to read. I highly recommend it. Mattimeo by Brian Jacques is the third book in the Redwall series. I just love this series. It takes me back to when I was a kid. It is so much fun to read! Vengeance of Hope by P.J. Berman is the debut novel set in the world of Bennvika. We follow three main characters, Silrith, a princess; Ezrina, a rebel; and a lesser noble, Zethun as they stand up to tyranny and religious persecution. Will they succeed? I have to say, this is one of the best stories I have read featuring strong female characters. It was refreshing to read about a female character who is actually strong in the ways that women need to be strong. Standing up for what they believe in and fighting for what's right. Mossflower by Brian Jacques is the second book in the Redwall series. I'm reading this series in publication order. This is such a fun book. I'm reading this whole series, and I just love the characters and the world Jacques created. I highly recommend it to anyone who loves talking animals in their fantasy. 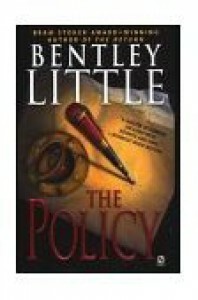 The Policy by Bentley Little is a story based around insurance, and for Hunt Jackson it is more than just insurance that he finds himself purchasing. Bentley Little has a bizarre way of getting his stories across to the masses. With great writing and a fantastical imagination, Bentley gives you more than a story. This was such an intriguing read for me. The Vanishing by Bentley Little is a stand alone horror story about children disappearing or being murdered. I wouldn't really call this a horror story, but it is the most bizarre story I have ever read. Little's writing is great and his imagination is certainly unique, and I thoroughly enjoyed this book. I loved reading Unfinished Tales of Númenor and Middle-earth as I hadn't read this book before. It added to the stories that I am already familiar with. This is a great addition for collector's of Tolkien's work. Tales from the Perilous Realm by J.R.R. Tolkien is a collection of Tolkien's novellas and poems which have been in various books over the years, but have not been released in one volume. The Silmarillion by J.R.R. Tolkien is the story of how the creation of Tolkien's world came to be. It has been years since I have read this book, and it was such a delight to revisit Tolkien's world from the beginning of the First Age. It is exciting and sorrowful, and I loved spending time with all the characters and visiting the places they traveled. This is a great read for lovers of Tolkien's work. I enjoyed reading these tales. Tolkien has brought to light more characters and their labors which provided me with great details of Tolkien's world he had envisioned. A lot of trials, loss, and tragedy struck the peoples of Gondolin. I loved reading about some of the history of Tolkien's world. The characters are deep with trials of their life lead and their losses. A big treat for me was reading Christopher Tolkien's telling of his father's revisions, additions, and his father's thoughts. This had to be a daunting task and with the help of Christopher's colleagues, he was able to bring to light these tales of the elder days and to give a bit of insight as to what Tolkien's father had in mind concerning his passion of his created world. Christopher Tolkien doesn't get the credit he deserves for helping bring his father's world to light, and I am without question indebted to him for his toiling efforts of bringing this epic story to a full and completed tale, as fully as he could, and bringing it to the public for our enjoyment. I will cherish these stories and will pass them to my children and grandchildren in the hopes of them loving this epic story as much as I do. Beren and Lúthien is another story that finally has seen the light of day. I loved reading this tale and learning more about other characters in Tolkien's world. In addition, the poems were beautiful with beautiful prose. I had not realized what an amazing poet Tolkien was. This was an added treat for me. I highly recommend anyone who loves Tolkien's work to read this. You will not be disappointed. The Children of Húrin by J.R.R. Tolkien is a tragic story of The Children of Húrin, one of the unfinished tales in The Silmarillion. Though The Children of Húrin was a great read, it was a tragic one, but I loved learning of what happened fully to Hurin's children, Túrin and Niënor. It has been years since I've read The Silmarillion, so this was a necessity read, for me. I highly recommend lovers of Tolkien's work to read this tale. Roverandom by J.R.R. Tolkien is a story based on an event that happened when Michael Tolkien was but a boy. Four-year-old Michael Tolkien lost his favorite toy dog and his father created this story to give Michael an idea of what might have happened to his little toy dog. 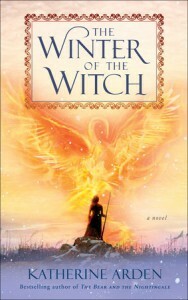 The Winter of the Witch by Katherine Arden is the final installment of the Winternight Trilogy. Moscow is on the brink of war, and the plague has come, and one witch girl, Vasya, is determined to do what must be done to save her city. This was an excellent ending to a wonderful story of one girl's determination and strength. Katherine Arden's ability to draw the reader in and hold them is outstanding. A brilliantly written novel of self discovery, determination, strength, love, and doubt in oneself make this one of my favorite stories. A must read for anyone looking for a strong female protagonist.